(Note: Picture is of a traditional Thai Sak Yant tattoo. The design is called Gao Yord. The picture is from Crimson Falcon on Deviant Art). The issue of tattoos, their place in society and what they represent about the people who have them and why they get them, has come across my desk twice this week. Well…that’s a slight exaggeration. I don’t have a desk. Tattoo issues came up unconnectedly in the Guardian (the U.K. Newspaper) and the Cracked Podcast. I like both organizations: I listen to the Cracked podcast at work, and the Guardian I…can identify as being a U.K. newspaper without having to look it up. Both segments featuring tattoos included things I found both personally objectionable and factually inaccurate, and this is a response to each of them in chronological order. In the interest of full disclosure I have a tattoo. This would come up later, but I do want to be up front about it. Hence the title above, and the articles below. 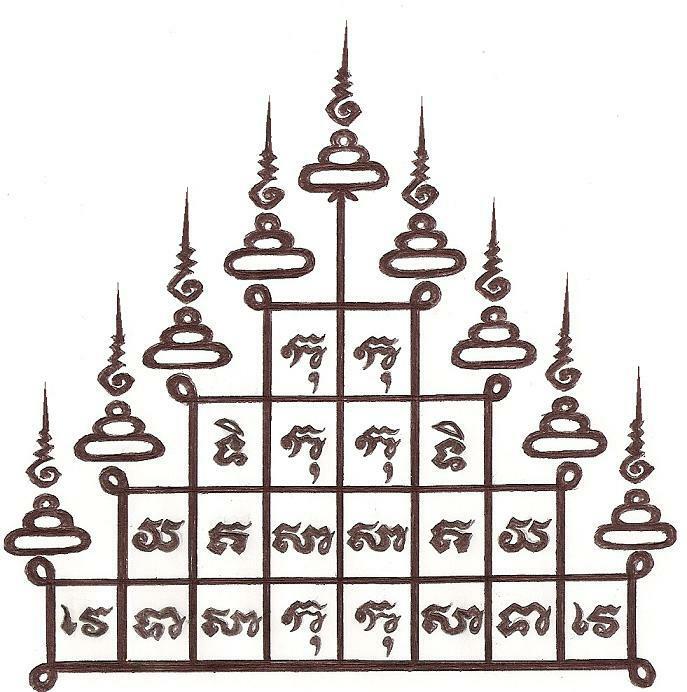 The image associated with this article is in fact a drawing of the tattoo on my back, which is a traditional Thai tattoo from my time living in Bangkok (although the design is traditional, it was done in a mall). It’s an article written under the pseudonym Tess Morgan (the article admits it is a pseudonym) about a mother’s reaction to her 21 year old son getting a tattoo on his arm. She cannot speak to him for several days, cries repeatedly, and as of the writing of the article never brought herself to actually look at the tattoo. It seems to me, unhinged by shock, that this might have been the better option. From time to time I come across things that make me want to call my mother and thank her for being so normal. This would have shocked me in High School, but in retrospect…wow. I moved across the world for a year and a half, came back with a plan to move to a state I’d never lived in and go to law school, and with a big tattoo on my back. Of all of these things, she batted an eye at the moving around the world and the not moving back to Colorado…both of which are normal. Of the tattoo she had no objection. Of course both she and my step-father have tattoos as well, so there would have been very little room for her to get bent out of shape. So…thanks, Mom! The article ends on the note that what ultimately hit her was how this “took a meat cleaver to my apron strings” and made her redundant. He made a choice, and her feelings didn’t enter into it. She was redundant, and decided this was a legitimate cause for grief. Ok. I get that I am not a parent, and I can completely understand that the process of accepting your child has become an adult and will be making independent adult decisions from now on must be a difficult one. As a friend said you raised a creature in your body and then out of it for over 18 years—its independence is going to cause you issues. But the point of all of those years of guiding and caring is to get to the point where he makes independent choices, and hope that your guidance means they make good ones. A lot of criticism has focused on that it is his body and his choice, which is true, but I think on some level the author gets that. But the more fundamental point for me is the over attachment. Congratulations, you got him to the point where he knows that going out and getting drunk and getting a young woman pregnant is terrible. He doesn’t seem to be addicted to drugs or alcohol, he earned at least 150 quid himself so he seems to be employed. He exercised his choice in a way you disagree with, but in a way that was responsible and safe. You’ve raised a son who is well adjusted and makes good choices and is unlikely to try to film himself sticking his hand in a blender, and are thus redundant? Celebrate, lady! That’s a goddamn victory for parenting as far as I’m concerned. I would ask this mom if she ever did anything her own mother thought was objectionable. Maybe she didn’t like the husband at first, or disapproved of career choices. Or was upset by an around the world move at first. Lots of things happen to signal the movement from a child to an adult, and they run the gamut from good to neutral to bad to OH MY GOD WHY DID YOU DO THAT to OH **** LIONS GET IN THE CAR. Is a tattoo, in the grand scheme of things, really worth an OH MY GOD WHY DID YOU DO THAT? Would that have been the response you wanted from your mother, and if not…why are you doing it? Also…tattoos really are not that bad. She talks about self-mutilation, and “smit marks on sheep”. I get that you don’t like them, and from a pure perspective it is self-mutilation. But a form that has been practiced for hundreds of years. One that has meant everything from respected tribal leader to criminal to being worn by Princes and celebrities and homeless people, and thus which means nothing in society. Yeah, about that lawyer thing. Let me check my back…yep. And my Colorado Bar card. Yep. Turns out its fine. The Cracked podcast is uniformly interesting and funny, but the tattoo bit got to me. On the most recent episode (about why you don’t know what you look like) they are talking about plastic surgery and body modification, and advance the theory that we would see way more people going overboard with plastic surgery if it was cheaper. They got on tattoos, and brought up the idea that tattoos are the inexpensive way of accomplishing the same thing—of modifying your body to hide, diminish, or accentuate a specific feature. Dr. Roger Spain (First Applicant): [House won’t hire him because of a tattoo] Wow! I thought you’d be the last person to have a problem with nonconformity. Dr. Gregory House: Nonconformity – right. I can’t remember the last time saw a twenty-something kid with a tattoo of an Asian letter on his wrist. You are one wicked free thinker! You want to be a rebel? Stop being cool. Wear a pocket protector like he does, and get a hair cut like the Asian kids that don’t leave the library for twenty hour stretches. They’re the ones who don’t care what you think. I don’t have an issue with the exchange in and of itself. There are a lot of people who go out and get a nonconformist tattoo, which is one of the most conforming ways to express non-conformity. But the podcasters expressed this as the reason why people get tattoos, which is what I have an issue with. Yes there are a number of people who go the “conformist non-conformist” route that House talks about, but that represents only a percentage of people who get tattoos. Even people who have them in locations that are regularly visible don’t necessarily have them because of a shallow desire for individuality. My tattoo, for example, is in the middle of my back. Specifically lower than the traditional spot for it, because the traditional location would have it peak from above the collar of a dress shirt. The only way a client, employer, or judge will know I have it is if I tell them, we work out together, or I make it a habit of taking my shirt off at work. Which give that my body type was recently calculated by BMI as “Jabba the Hutt,” I don’t believe I will be doing. Otherwise it is a silent part of my life that only people I know well (and the three and a half readers of this blog) will be aware of. This doesn’t strike me as being a play for attention or trying to show how non-conformist I am, given that it gains no attention from anyone and shows nothing to them. And while they do offer another explanation, saying that people who get tattoos as a cheap alternative to plastic surgery is not more satisfying. What trait am I trying to distract people from with the tattoo they can’t see? Or someone who gets the name of a deceased loved one tattooed on their body to remember them? It’s the same issue as the lady in the first article, but manifesting in a different way. She assumes that the tattoo is to hurt her or that it was done in a knowing rejection of how much it would hurt her; Cracked assumes that tattoos are to make a statement to other people or to cover up something that other people will see. Both completely reject the idea that a tattoo can be for completely personal reasons, something internally fulfilling on an emotional level. And ultimately that is my issue with both. They create one vision of what a tattoo is for, and insist that it is the only vision. Whether the vision is to cover up a flaw or to hurt a mother it is sweepingly broad, not as bad as “All blondes” or “All men” but set on the same scale. And the problem is both of them are wrong. Of the thousands of tattoos given out every day there are hundreds, if not thousands, of reasons for them. Children’s footprints on a mother, a rose on an ankle, a howling wolf on the bicep. Some will be seen, some will never be seen. Some are to be unique, others really are unique. A tapestry of reasons for putting a permanent memorial on your body. Some that prove Cracked right, some that prove the Guardian right, and a lot that prove neither right. So what’s the point, in the end? Generalities are lazy, generally speaking. Not everyone gets tattoos, or even plastic surgery, for the same reasons. They do not always carry a statement along with them, or a message, or broadcast or cover an insecurity. The reasons for them are as varied as the people who get them, and attempts to declare one reason or another will inevitably fall short. They can’t be used as a divining rod to find out how your son feels about you or what insecurities you want to cover up, unless they were done for those reasons. And that’s not a really strong ending, so assume I put in an explosion here. This entry was posted in Rants and tagged Dishonor. Well written article, Matt. I have several tattoos, including one on my lower back that everyone, tattooed and not, all roll their eyes at and declare a tramp stamp. The thing is, it is a symbol of strength and protection that is right over the scoliosis curve in my spine. I got my tattoo for myself, and when I encounter others with tattoos, I don’t judge, I don’t know their stories. Oh, and congrats on having an awesome tattoo. Have you seen Theo’s? It’s very funny and very him. I am trying to decide if it’s a good thing that my acceptance of all the behaviors cited was assumed apparently – and therefore not worthy of mention. Or perhaps it’s a gender issue? I’ll go with it’s a good thing that my acceptance was a given :). Michael — I, for one, have always admired your unwavering support of who Matt was/is/trying to be. Uji — going to Thailand was brave & crazy & wonderful. Cool that you got a tattoo for whatever reason.